This entry was posted in Archive, Reddit and tagged Favourite, Reddit, todayilearned on 31/03/2014 by John. This entry was posted in Archive, Twitter and tagged @openculture, Favourite, Twitter on 31/03/2014 by John. This entry was posted in Archive, Twitter and tagged @theretronaut, Favourite, Twitter on 31/03/2014 by John. This entry was posted in Archive, Twitter and tagged @paleofuture, Favourite, Twitter on 31/03/2014 by John. This entry was posted in Archive, Twitter and tagged @PaleofutureBlog, Favourite, Twitter on 31/03/2014 by John. This entry was posted in Archive, Twitter and tagged Favourite, Slate, Twitter on 31/03/2014 by John. “…doing the proverbial ‘really good’ science-fiction movie.” Fifty years ago today, Stanley Kubrick wrote Arthur C. Clarke a letter. Thanks Andrew. This entry was posted in Archive, Feedbin and tagged Coudal Partners Blended Feed, Favourite, Feedbin on 31/03/2014 by John. 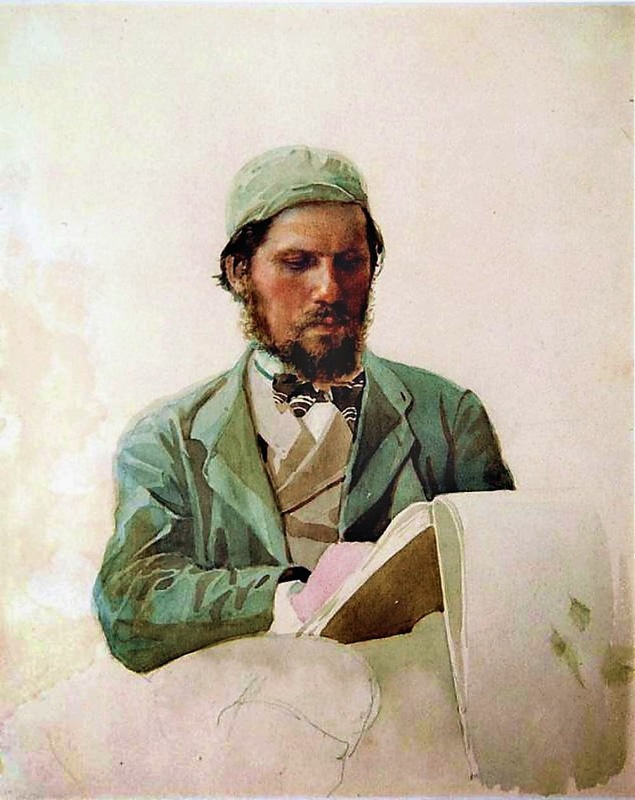 Here’s an example of a well controlled watercolor portrait from 1874 by Nikolai Yaroshenko. The portrait shows his friend and fellow artist Ivan Kramskoi. A watercolor like this would begin with a careful pencil line outline drawing on fairly smooth paper or board. You can see the untouched pencil drawing of the leg in the lower part of the picture. Following that would be light, neutral washes of watercolor, such as what you see on the hand and on the flipped-back pages of Kramskoi’s book. He tested one of his green mixtures on the right side of the picture. It’s not a bad idea to have a test-swatch section of the sketch where you can fool around with the brush and try things out. This entry was posted in Archive, Feedbin and tagged Favourite, Feedbin, Gurney Journey on 31/03/2014 by John. This entry was posted in Archive, Twitter and tagged @atlasobscura, Favourite, Twitter on 31/03/2014 by John. Good brush care can extend the life of an oil painting brush tenfold, and save you hundreds of dollars in the long run. In this two minute video, William Whitaker demonstrates how he cleans out an oil-painting brush. 1. Dip brush in odorless mineral spirits and wipe out solids in shop towel. 2. Wash out the brush in soap and water. 3. Using another brush, work up a lather of brush-washing soap in the palm of your hand. 4. Grasp the tips of the bristles and wiggle the lather into the bristles and work it into the area where the bristles meet the ferrule. 5. Add brush conditioner to restore the oils into the bristles, as soap and mineral spirits alone will dry out the brush. 6. Gently point the brush before putting it away.